Note: This is a review of the sequel to Across the Universe and contains mild spoilers for the first book. Elder and Amy and the rest of the violent wacky bunch are back on board the Godspeed. They're still traveling across the universe and they've got 99 problems to solve but a dictator-like Eldest ain't one of them. I psychotically foamed at the mouth at one point over the first book in this series. I just can't understand characters who go against the logical course of action, or who make snap decisions that come out of left field. Like Amy's insistence in the first book to overthrow the generational ship's government. She says it with all the same effort as saying "I'm going to eat this Pop Tart right now." Like it's completely normal to wake up from a frozen coma and decide to topple a government. So far this looks like a negative review. Wrong. I'm going to do what I now call a Beth Revis and twist this review all up in your face and make you crap your space pants. And I'm going to do this in the last 20% of my review. Just like what Beth Revis did with A Million Suns. There are things here to enjoy. There are a few payoffs that I wasn't expecting. There were a few plot twists that I did not see coming. There were a few new characters introduced that I did like. More of the ship is explored. More of the ship's history is explained. Everything that you think happened in the first book? Yeah. Flush that dren out of an airlock and call it a day. So, I went from hating the first book to thinking "Maybe I should give that one a try again" to "Nope. Not gonna do it." Because really, I think it's enough for me to say that I will be reading the next book in the series. 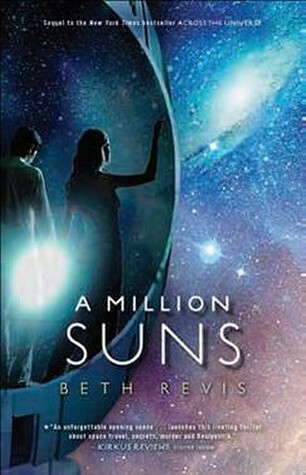 Take your small victory, Beth Revis, and write me a sequel to this one that is equally as entertaining. Full Disclosure: I read this on my Kindle and received my copy from the Louisville Free Public Library. *Seriously. These are the most morally oriented teenagers ever. **If it weren't explained I would've contacted Neil deGrasse Tyson. He would have set Beth Revis straight. Or slapped her. Side Note: I read this entire book while high as a kite on Benadryl. I have determined that I would've enjoyed this one even without the aide of drugs. I'm going to do what I now call a Beth Revis and twist this review all up in your face and make you crap your space pants. And I'm going to do this in the last 20% of my review. Just like what Beth Revis did with A Million Suns. It's very important to one's health to LOL before 7 AM every day. THANK YOU. HOORAY for coffee that tastes fabulous again! I do love these words. Made me laugh. I want to make a list so bad but I'm gonna spare you that noise today. The next time a sinus headache takes me out for a week... I'll be more prompt to go to the store and stock up on allergy medication. Ah, NDT, my favorite astrophysicist. Once I'm all up and graduated (4 more weeks, 4 more weeks) I'm gonna read his book about Pluto. NDT is my favorite as well. I listen to his podcast every week.